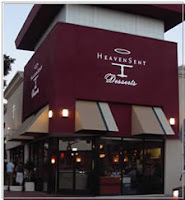 30th Street Blog: Heaven Sent Desserts - Is it from Heaven or is is from H--l ...? Heaven Sent Desserts - Is it from Heaven or is is from H--l ...? An all time favorite at Heaven Sent Desserts is the special offering for the 30th on 30th this month! The heavenly Bourbon Street Bread Pudding is the richest, the tastiest, the most scrumptious bread pudding you have ever tasted. It is moist, it is flavorful, it has texture (being made from flaky buttery croissants it has the lightest texture - none of that stodginess of other puddings ...) and it has that temptation sauce from ... we are not sure ... which puts the finishing touch (and kick) on this true New Orleans Bourbon Street Bread Pudding! And, just for you the price will be $5.25 instead of the usual $7.00 - so bring your best friends, your date and yourself, then indulge!